Walker Camp is a campsite north of Cheydinhal containing NPCs. 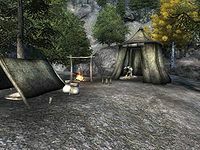 Walker Camp is a semi-large campsite inhabited by two members of the Camonna Tong, the criminal organization of Vvardenfell, and is used primarily for illegal skooma trafficking. Due to its location in the Valus Mountains, the campsite and surrounding area are bold, cold, and with minimal vegetation, with only a few Motherwort sprigs and some fungus scattered around near the pines. The camp consists of two tents with bedrolls and the inhabitants live normal lives with daily routines, meals, and sleeping. An open food grain sack and an additional food sack can be found near one of the two tents, while the adjacent tent contains a locked chest with some upper-level loot; all containers can be emptied without incurring a bounty. A burning fire heats up a cooking pot in the center of the camp and the conveniently placed stool is often used by the thugs for their daily meals. Walker Camp plays an important part in the skooma trade operation performed by the Orum Gang of Cheydinhal; as members of the infamous Camonna Tong, the two inhabitants seemingly couldn’t resist the profits of working with the all-Orc gang. 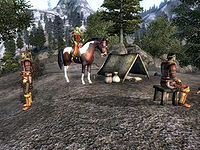 As such, while acting innocent towards strangers, the thugs are indeed performing illegal activities from the camp: every Fredas, just after noon, Orum gang courier Oghash gra-Magul shows up at the campsite, carrying the skooma she picked up in the Waterfront District the Tirdas before. Once there, she quickly delivers the skooma to one of the thugs, who hands her a gold reward in exchange. After Oghash has left the camp, both thugs head up the mountain towards Kingscrest Cavern and put the skooma in a well-hidden hollowed rock. They then return to the camp, leaving the skooma to be removed from the rock, presumably by their Vvardenfell employers. Just north of the campsite is a small lake (not shown on your map). It contains an underwater wilderness chest (minor loot) at its eastern end. Esta página foi modificada pela última vez à(s) 13h46min de 11 de setembro de 2013.